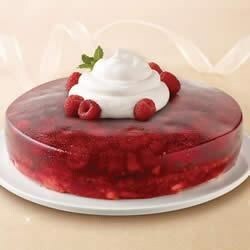 "This raspberry cake makes a pretty dessert for any special occasion." Add boiling water to gelatin mixes in medium bowl; stir 2 min. until completely dissolved. Add raspberries; stir until thawed. Pour into 9-inch round pan sprayed with cooking spray. I made and tried it, it's sooo good thanks!! This is so easy to make and was amazing. Everyone loved it and I've already been asked to make it again.